Anyone who has gone on a lengthy camping trip with a group of people knows the importance of a large tent. Of course, you should also consider the option of buying multiple tents, but that’s usually more expensive upfront plus it often results in higher camping fees during your trips. It would also cost you more time setting up and breaking down and it takes up more space, so it’s quite understandable that bigger tents are still going strong. Typically speaking, an eight to ten person tent is ideal for a group of four to eight people who would like to sleep comfortably and entertain themselves at night. Ten people could easily squish inside some of the tents on this list as well and manage to get a decent night’s sleep, but I wouldn’t recommend this for longer periods. Whether you are planning a comfortable, luxurious camping trip for a few people or a back-to-basics trip for up to ten people, you have come to the right place. 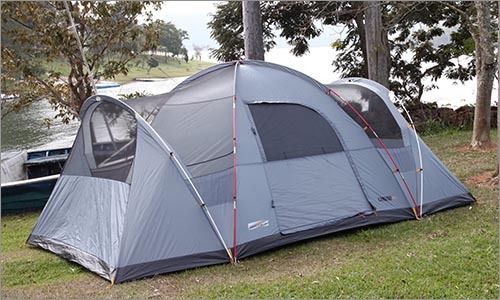 This page features fourteen of today’s most popular, top-selling eight to ten person tents. I came up with this list based on hours of research. In my research, I looked at sales statistics, product specifications and consumer opinions to bring you what I believe are the best fourteen tents available on today’s market in this size category. Welcome to the Top Five Choices list. This list is comprised of five of the top eight to ten person tents available on the open market. 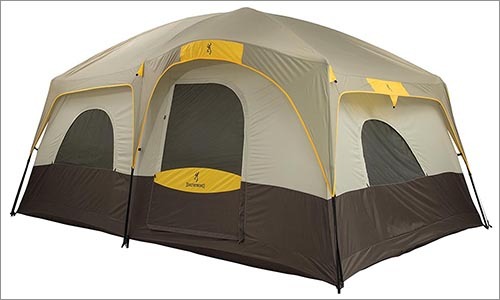 Not only has each of these tents proven itself through exceptional consumer reviews, they are each also designed to meet very specific, popular needs. Though I find it rather hard to believe that anyone may be disappointed with any of the tents on this list, I would like to point out that if none of these tents suits your personal desires, there is a list of nine very impressive tents in the section below this one. Check out our honorable mentions for more tent selections. Can you believe that a canvas tent actually claimed the top position on this list? In all honesty, I was a little shocked by this myself. When I select a tent for the position of “Best Overall”, my main objective is to bring you a tent which is built to impress. I don’t worry about cost when I select a tent for this position. All I worry about is that it has received incredible consumer ratings and is the top quality tent of all the hundreds of tents I’ve researched. I truly never thought that a cotton tent would be the one to claim this title, but I simply couldn’t ignore its many wonderful qualities and the way that consumers raved about it in their reviews. Of all the popular, top-selling tents on this page, this Kodiak canvas tent has received the best reviews from actual consumers. They have reported that it more than lives up to its promises and provides a durable, reliable shelter throughout even some rather nasty rain and wind storms. Most of the tent is constructed of cotton, making it much more environmentally and allergen- friendly. Still, it should be noted that it has been sprayed for extra waterproofing and does feature a polyester floor for further water protection. Though I could go on and on about the Flex-Bow Deluxe in explaining how and why it received the top position in the Top Five Choices list, I feel it would be best to do so on a separate page. Sometimes, I feel like a broken record. I repeat myself over and over again, trying to make sure my message is heard. If you have already read reviews for different sizes of tents on this website, you have probably already heard me explain the concept of value. I will explain it again, though, in case anyone out there hasn’t yet heard my definition. I believe it is important to define value before telling you which tent I believe has the Best Value. Otherwise, if we disagree on what exactly value is, you may think I’m misleading you with my selection. I believe that value is the place where affordability and quality meet. I could find you the cheapest eight to ten person tent on the market and slap this title on it, but that wouldn’t really be fair to you. By bringing you the cheapest tent, I would probably be bringing you the least reliable tent. On the other end of the spectrum, I could bring you a tent with top quality as I did for the “Overall Best” title. Doing that, however, I would not be able to bring you a tent which is easily affordable on a budget. Instead, I try to aim for somewhere in the middle – a tent which is decently affordable and rather impressive in its own way. After much research, I believe that the Browning Big Horn is exactly the tent which best fits this description. When sharing a tent among a large group of people, it is often preferable to have your own separate areas. My partner and I have a friend who likes to sleep in his underwear when it is warm at night. Sharing a tent with him certainly taught me the importance of room dividers. Similarly, room dividers are a great way to offer people privacy as they change their clothes. This is especially important when it’s raining outside and everyone retreats inside the tent to stay dry. My kids enjoy room dividers simply because they find it “fun” to have their own space to set up their own sleeping bag and surround it with mounds of stuffed animals. Knowing that separate spaces are very important to many people, I thought it would be best to include a tent which featured more than one room. 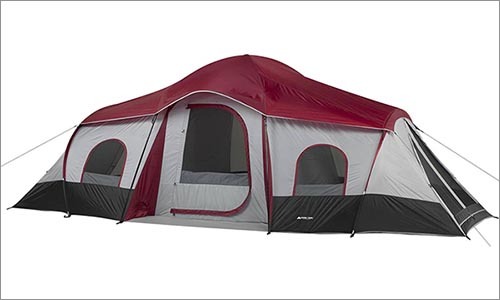 When I stumbled across this three room Ozark Trail tent and realized that it not only had more rooms than any of the other multi-room tents I had located but that it had also received substantially better reviews from consumers, I immediately realized that this tent must be awarded this title. 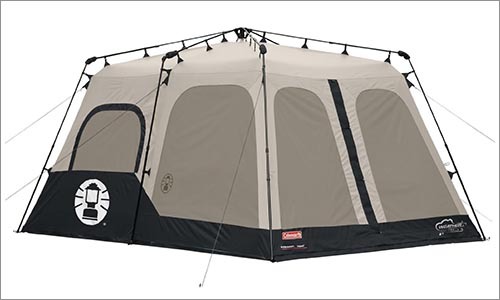 Although the three rooms and exceptional consumer reviews are what bumped this tent into this position, it also boasts a great deal of other impressive features including three doors, 200 feet of living space and over 6 feet of headspace. To tell you more about these features as well as many other impressive features, without overtaking this page, I will need to continue this article on an entirely separate page. This oddly-shaped tent reminds me of the circus and makes me imagine that camping in it would feel like living under the big top – which, if you ask me, doesn’t sound bad at all. Not only does this tent feature eight short sides which create a perfect octagon, it also features a big top-style roof which pulls panels of fabric from each wall up toward its pinnacle. I can sit here and talk about all of this tent’s special little specifications for a while, but I would prefer to get to the point here and talk about those other important considerations elsewhere. I am sure that you are more interested in learning why I chose this tent as being the one with the best ventilation. I will be honest, it wasn’t my first thought when I looked at a picture of this tent with its windows all closed. I remember thinking that it looked like a terrible heat trap, especially since the built-in fly means there is no mesh on the roof. Then I saw a picture with the windows all open and I gasped. Every single wall features either a window or a door and each of those windows and doors is incredibly large. With eight different sides equating to eight different directions, it will not matter which way the breeze is blowing – this tent will allow it to pass right through. Although I have never owned an instant tent, I have always envied those who do. On more than one occasion, while still struggling with poles and sleeves and clips – just trying to get my tent to resemble something habitable – I’ve watched as my friends set up their instant tents, packed up their bags and headed toward to the lake for some early evening fishing. Knowing the frustration I’ve felt in moments such as that, I realized that many of you are probably in search of a tent which alleviates all of that hassle. As the Best Instant Tent, the Core 9 Person Cabin does just that. Simply unfold the tent material and you will see that the poles and hubs are all already connected to the fabric. All you will need to do is extend the poles and clip them in place as you lift your tent into a standing position. There will be no need to worry about whether or not you managed to find the correct location for the correct pole, because they will all already be where they belong. Although selected for its instant capabilities, the Core 9 Person isn’t only easy to set up, it also boasts many other great qualities and features. For example, it stands a grand total of 6.5 feet in height, making it perfect for people of all sizes to fit comfortably inside. It is perfectly possible for nine people to sleep inside this tent. However, its height implies many other possibilities. For example, its large 14′ by 9′ living space, combined with its height, means that if you prefer you can have a sleeping area with a large queen bed on one side of the divider wall and an eating or game playing area with a fully assembled card table and chairs on the other side. The list of Top Five Choices outlined the best tents in very specific categories, such as top quality, best multiple rooms and ventilation. What about those people who are simply looking for an all-around great tent? I created this list of runners up for those people. None of the tents on the following list has been made with the absolute best quality – that tent is up in the Top Five section. None of these tents has the best value – that tent is also up in the Top Five section. None of these tents is the best at meeting one very specific need (such as the Best Ventilation and Best Instant tents listed above). Though these tents do not fall into any of the categories listed in the Top Five section, I can assure you that each of these tents is just as impressive in its own way. 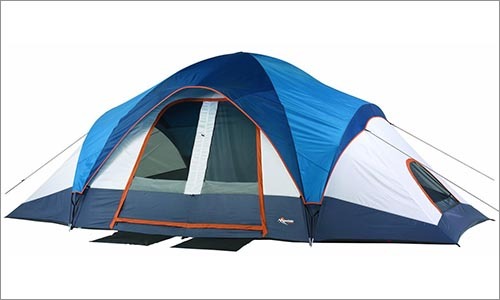 A basic requirement for being included on this website at all is that a tent must have received excellent consumer reviews – these tents are no different. Despite not being featured in our Top Five section, each of these Runners Up has received rave reviews from very satisfied consumers. Read on to see why they’ve received such wonderful reviews and what that may mean for your purchasing decision and camping experience. 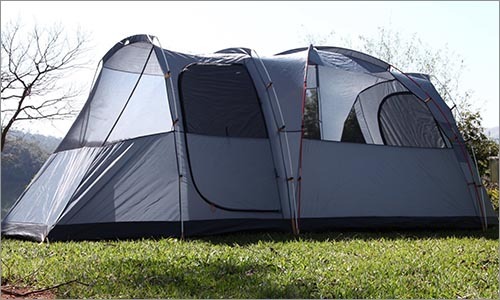 Despite not allowing for a lot of headroom, this tent can easily sleep up to ten people. It is clear to see from the design of this tent that it is not exactly built for entertainment purposes. This is not the tent in which you will be erecting a card table or hosting a rainy afternoon dance party. Still, this is a great tent for those who are more interested in purpose than they are luxury. The low ceiling of this tent is actually a full oval dome which extends from its pinnacle all the way to the ground. Though dome-shaped roofs offer superior structure to tall tents, the dome is best used when it actually makes up the entire tent – a seamless, corner-less arch which constitutes both roof and walls. 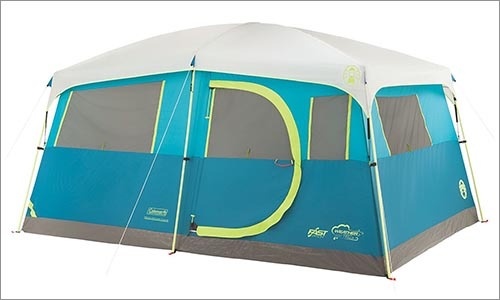 This design evenly spreads the tent’s load between its various footings and does not allow for any flat areas which may cause water to pool or which may put up some sort of force against the wind. Therefore, despite not being as tall as many of the other tents on this list, one could easily argue that this tent is much more practical. The domed shape of this tent allows you to house up to ten people for a good night’s sleep without any of the worry that comes along with tents whose external walls are much taller. It will stand up to harsh weather much better and still allows for some dressing space near the middle of the tent, where its height reaches 76 inches. A removable divider wall can be placed through the middle of the tent, effectively cutting it into two separate living spaces, each accessible through one of the twin doors located beneath the rainfly’s built-in awning. This large, rectangular tent features some of the straightest walls I have seen on a tent. Though some people may argue that flat walls aren’t great in windy conditions, I would like to argue that you can choose not to camp in windy conditions. In all honesty, the wind would have to be rather strong to actually put enough pressure on these flat walls to cause any sort of damage. If you are like me, you camp in the forest, protected by trees which slow the wind down for you. What is wonderful about these straight walls, however, is that they allow you make exceptional use of the 140 square feet of floor space. Not a single inch will be wasted by the wall being angled too closely to the floor. Instead, you will be able to sleep or pile belongings right next to the wall. This tent has much more to offer than simply its wonderfully straight walls, however. Its full mesh roof and multiple mesh windows all work together to create excellent airflow. The tent comes with a rainfly to keep water from funneling in through the mesh roof, while still allowing air to flow freely. A rare LED light and fan system can be hooked up to the center of the ceiling and controlled with a switch located part way down one of the walls. Simply insert a few batteries, flip the switch on, and enjoy a cool, well-lit environment. You can even choose to have only one or the other turned on, so that you can even stay cool in the dark or warm in the light. 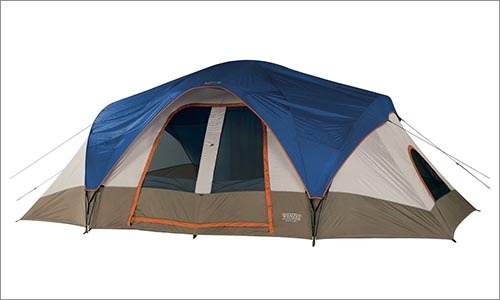 This large 14′ by 10′ tent can easily fit eight people for a decent night’s sleep. I find it amusing that some other companies claim that their 14′ by 10′ tents will accommodate up to ten people, whereas Coleman clearly claims that this one will best fit up to eight people. A zippered room divider allows you to divide this tent into two seven foot by ten foot spaces, effectively creating two rooms. You can choose to use each room for different purposes, or set up two queen beds to create two bedrooms. If you use the two queen beds option, you will really only fit between four and six people in this tent, but you will find yourselves with plenty of room to spare for your belongings and for moving around your beds. Also impressive, this tent’s collapsible poles are always connected to it, making setup a breeze. Though I do not believe that room dividers are really essential in tents, they are nice when sharing tents with other people, because they allow for private dressing areas. This is especially important on rainy days when you really do not want to kick everyone else out of the tent just so that you can get changed. As someone whose children have ripped a tent more than once when trying to squeeze through a wall and a divider screen, it is nice to see that this one features a zipper down its center. Instead of having to squeeze around it or take it down each time you want by, you can easily zip it open and even pull it back like curtains. 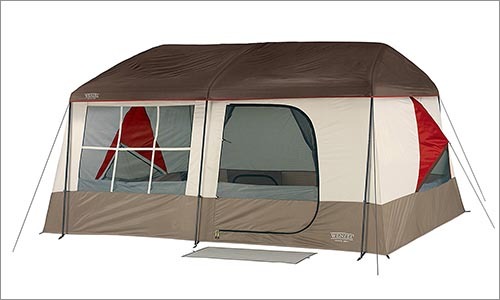 This tent also features five windows and a mesh window in the large T-shaped door. There is no roof ventilation because this tent is fully sealed without a rainfly. Still, the many windows, one on each side of this tent, should allow for adequate ventilation and airflow. Of all the cabin-style tents I have reviewed for this website, this one reminds me the most of an actual cabin. I believe it is likely due to the panel-style window next to the door. Whatever the reason, its actual cabin-style appearance gives this tent a little bit more visual appeal than many of the rest. Though this tent claims to sleep nine people, I must advise that it would most comfortably sleep somewhere around six people or less. Two queen-sized air mattresses can easily be set up in this 14′ by 14′ foot space. In fact, you may be able to squish two queen-sized mattresses and a single cot if you aren’t too worried about finding a place to store your other belongings. Measuring over 7 feet in height, this tent offers enough headroom for most average and even irregularly tall people to move around with ease. The cabin-style roof means that there is more headroom along the center ridge of the tent, but that it is equally tall from one end of the tent to the other. Two side windows, one front window, a mesh door, ground vents and a fully mesh roof all make this tent one with excellent airflow. Even when the door, side windows, and front windows are all zipped up tight in a rainstorm, the ground vents will pull cool air in while the mesh roof will allow hot air to escape. Don’t get this cabin confused with the Coleman 8 Person Tent listed a little further up this page – these are two very different outdoor domiciles. This particular domicile is shaped like a cabin. This entire conversation about these two “domiciles” is confusing, because both are technically tents, but Coleman chose to bestow the title of “tent” only upon the domicile listed further up this page. Pushing the 8 Person Tent out of our minds for a moment and focusing solely on this 8 Person Cabin, I would like to point out that the cabin is a very impressive tent in its own way. 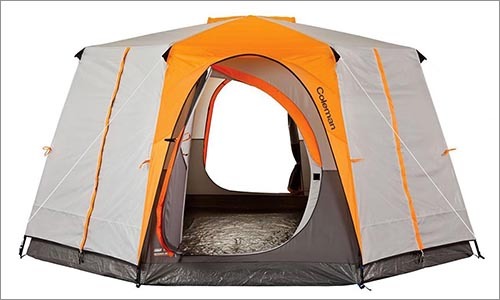 Measuring a spacious 8 feet by 14 feet, this 112 square foot tent can easily accommodate two queen-sized air mattresses or up to eight sleeping bags. Measuring almost 6.5 feet at its peak, this tent offers more than enough headroom for inhabitants to pack, unpack, change their clothes, and entertain guests. 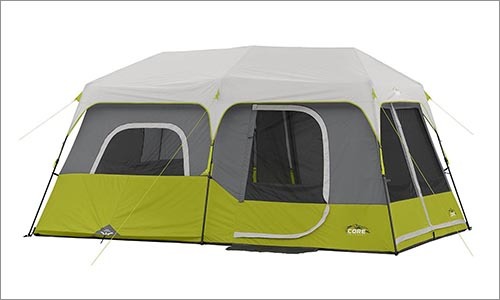 Although this tent does not feature a fully mesh roof like some of the others on this list, it features multiple windows and a mesh panel on the oversized D-shaped door. Each of the windows can be zipped shut to keep the warmth inside the tent, making it perfect for the cool evenings of early spring and late autumn. Fresh air is always important, however, which makes it nice to know that this tent does feature two small roof vents. Canopies built over the vents allow them to stay open even when it is raining. In fact, this is one of the few tents on this list which does not feature a rainfly. Of course, you can purchase a rainfly separately if you plan to camp in extremely rainy conditions or would like to leave the windows open during a rain shower. I bet you’re beginning to wonder just how many 8 person Coleman tents actually made their way onto this list. I will save you some time – there are three. In all honesty, it truly speaks volumes about the quality of a Coleman tent when so many have managed to grace the pages of this website. It is no wonder that they are one of the leading brands in the camping gear market. Like the last Coleman 8 Person Cabin, the poles of this tent are collapsible into themselves and stay attached to the tent so that you will not need to fuss with finding their place when you are putting it together. Unlike that tent, however, this one features a fully-meshed roof for excellent ventilation on warm summer nights. It also features 10 more square feet of living space and a closet bump-out. Yes, you read that correctly. This tent features its very own closet. The closet measures two feet by two feet and protrudes outward so that it does not take much away from the actually living space inside the tent. It features a horizontal rod for hanging clothes hangers and even has its own special flap of rainfly to keep it extra protected. Measuring a surprising 15 feet by 10 feet, this tent is among the largest eight to ten person tents I have been able to find in all my research. This tent’s 150 square feet of living space is located beneath a 6.2 foot roof. Such height easily allows you to erect cots or air mattresses on stands. In fact, two queen-sized air mattresses will fit inside this tent with plenty of room to spare for other activities such as changing your clothes and unpacking your belongings. Essentially, this is a dome tent with two small wings built off two of its sides. The regular dome structure offers superior strength to the design of this tent, whereas the additional wings give you the extra space necessary to house more people. The side wings feature mesh roofing and large mesh windows to encourage airflow throughout the entire tent. A large rainfly reaches to the ground on each end and the back side of the tent while creating a pop-out awning over top of the doorway. If the rain is falling straight down, this will allow you to leave the door’s mesh window open for extra ventilation. Four poles are all that are needed to bring this tent into an erect position. Simply match the two red poles to their proper footings on the main dome of the tent and use the two grey poles to create the pop-out wings on either side of the dome. This Wenzel tent is rather basic as large tent designs go. 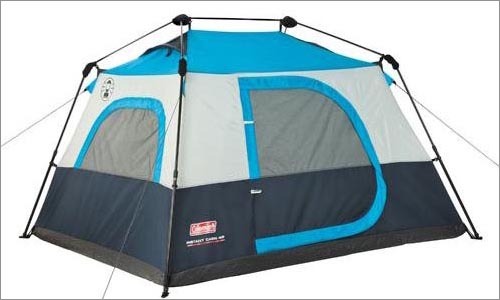 In fact, its basic shape resembles that of the NTK tent described above. Like the NTK, this Wenzel is, essentially, a dome tent with two built-in wings for extra space. It utilizes a four-pole system to hold it up. This tent has slightly more space than the NTK, however. Whereas the NTK features 150 square feet of space, this Wenzel measures 18 feet by 10 feet and features 180 square feet of living space. It will be even easier to squish eight to ten people inside this extra-large tent. If you would rather have luxury and comfort than fit an incredible number of people inside this tent, you will be happy to know that two queen-sized air mattresses and stands will effortlessly fit inside with room to spare. 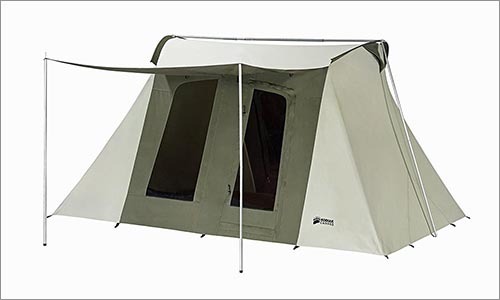 Another major difference between this tent and the tent described above is that this tent features superior ventilation. You will never have to worry about overheating on a hot, humid night under the fully-meshed canopy that is this tent’s roof. Multiple windows also add to the ease of airflow through this tent and will serve to draw cool air in as warm air rises up and out of its mesh roof. When the rain begins to fall, simply pull the fly over and secure it into place to stop water from falling directly into your tent. This abnormally long tent measures 17.4 feet by 8 feet and can easily fit up to ten people in sleeping bags. I believe that it would better suit four to eight people, depending upon how much stuff they bring with them and whether or not they would prefer to sleep in sleeping bags, on cots or on air mattresses. Over six and a half feet of headroom means that moving around in this tent will not be a problem for most people, even when the gear lofts are fully packed. 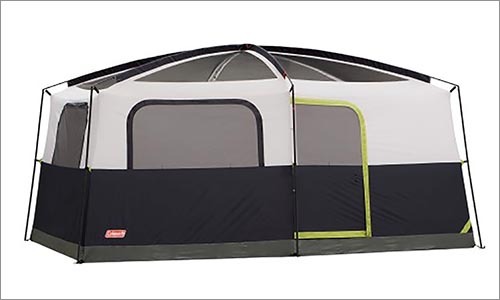 You read that correctly, this tent features gear lofts. Instead of having to take up space on the floor, any lightweight belongings can be placed in the long gear lofts which extend almost the entire length of the tent’s roof ridge. I would be careful not to place anything too heavy in these lofts, however, as they may pull down the tent’s roof just enough to encourage water to pool. Pooled water on a tent’s roof leads to leaks. The back half of the tent is separated from the front half of the tent with a removable room divider. Each side of the tent even features its own entrance for extra privacy when this tent is being shared between two couples, families, or even people. I may have said that this tent is well-suited for up to ten people, but it would definitely make rather spacious and comfortable accommodations for two people. Many windows and mesh panels mean that this tent will allow air to flow freely, maintaining a fresh environment at all times, even when the rain is falling down upon its 2000mm rainfly.